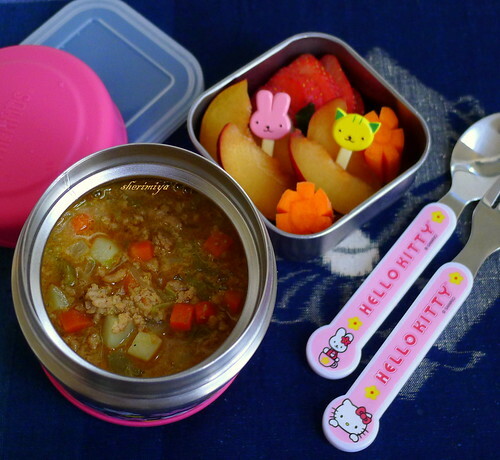 Keema Curry Bento, a photo by sherimiya ♥ on Flickr. Are you tired of the thermal bento yet? More one-pot meals on the way, I'm afraid. Muahaha! I think this one is my favorite. I adapted Just One Cookbook's Keema Curry recipe, but not by much. I made this batch with more "sauce" so it can get the rice all nice and yummy. Even though I used the medium-hot curry roux block, the kids can handle it just fine. So happy about that! It means that the adults and kids can enjoy the same spicy meal without addition of anything extra to the adult version. Also packed along with this thermal jar: plum, strawberry and carrot. That's a cool recipe, I like that it has tonkatsu sauce in there. Yum!! And no, I'm not tired of the thermal bentos, lol. My tummy is rumbling after seeing this one....delightful!